Whey Protein is a delicious blend of three of the highest quality whey protein concentrates and isolates from around the world: ultrafiltered, microfiltered and enzymatically hydrolyzed (partially predigested). This blend of specially processed whey proteins is designed to maximize amino acid absorption and biological value (BV). 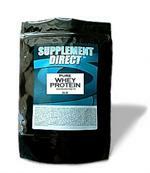 In addition, extra glutamine has been added (460 mg per serving) to this blend. Add 1/3 cup daily to 8 oz. of cold water, milk, or your favorite juice. Stir or blend. Xylitol is harmful to pets; seek veterinary care immediately.